Internationally acclaimed Duo Rêves is the creative collaboration of Quynbi and Eric Esteb, co-creators of whirlwind aerial/shadow show ‘Into the Dreaming’. 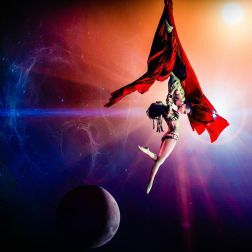 Bringing dramatic spectacle and glamorous levity to venues near and far, they have performed together since 2013 as aerialists, dancers, acrobats, jugglers, storytellers, and versatile cirque-style artists. Their unique hybrid aerial apparatus, the Dragonfly, is the only one of its kind in the world. Together, they have appeared as purveyors of dreams in Vogue Italia; Stardust Particles’ ‘A Brush with Death’, and live venues across the land and sea.